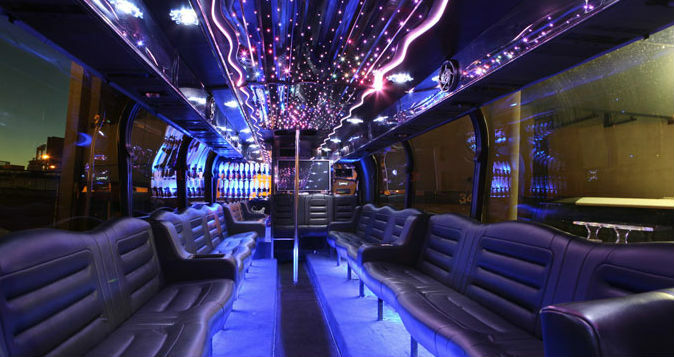 Party Bus San Jose offers the most exquisite and affordable party buses and charter buses in the Bay Area. Our dedicated team of staff and drivers are committed to your safety and enjoyment while riding with us. We take great pride in being recognized as one of the premier party bus companies in the San Francisco Bay Area, offering top quality services at unbeatable rates. Call and try our buses out for your next event. Whether it's prom, a bachelor or bachelorette party, your birthday, wine tasting, a concert, graduation, corporate, a sporting event or wedding, we can accommodate you and your guests in any of our luxury buses with the best amenities for entertainment. We have party buses and charter buses of every size and style for 20, 30, and 40+ passengers. Our party buses come with the finest built in amenities for ultimate fun. Check out our lounge-style leather seats, flat screen TV, DVD and CD player, fiber optic lighting, full bar stocked with ice and complementary beverages, great sound system with music hook up, dance pole, hardwood floors, and more! You don't get many chances to ride in a bus as spectacular as this. Call us today for a FREE quote. We will be more than happy to answer any questions you may have about our services, rates and our buses. We look forward to providing you with the best party bus service in San Francisco and the Bay Area!